For many lifters, cardio is a necessary evil. Make even short bursts of running safer with this research-backed change to the way your feet hit the treadmill. If you've ever been in a gym when a bunch of weight trainers are doing cardio, you've probably noticed that they tend to sound like a heard of buffalo storming across the open plains. Bodybuilders might not be the most elegant of runners, but they put their time in, even if it's only 10-20 minutes. Yet even in that short time, injuries can strike. You can prevent a lot of those leg-day-stopping injuries just by changing how hard your feet strike the running surface. In a recent study conducted at Hong Kong Polytechnic University, researchers found that novice runners reduced their risk of injury by 62 percent just by learning to run a little more softly. The harder you land on your feet, the bigger the value of a measurement called the "vertical average loading rate" (VALR). The higher your VALR, the greater your chance of injury. The goal of the study was to see if runners could learn to reduce their VALR. As part of the study, 166 novice runners used biofeedback to help them alter the way they ran. After 12 months of running 4.6 miles a week, the group reported a total of 28 injuries. Another group of 154 runners who didn't receive the training ran the same weekly distance over the same 12-month span and reported 61 injuries. The trained group sustained 10 cases of Achilles tendonitis and calf strain, while the untrained runners had none. The untrained group reported 23 cases of planar fasciitis and 18 cases of knee pain, while the trained runners had 2 cases of planar fasciitis and 4 cases of knee pain. Overall, the trained runners sustained 62 percent fewer injuries. In an earlier study by Harvard Medical School and Spaulding National Running Center at Harvard University, researchers found that people who land on their heels sustained twice as many injuries as people who land on their forefoot. The center's director, Irene Davis, Ph.D., noted that landing abruptly on your feet is like jumping from a height and landing stiff-legged instead of allowing the ankles, knees, and hips to absorb some of the shock. According to Davis, heavily cushioned running shoes don't prevent these kinds of injuries—and may even increase them. "Cushioning lulls you into thinking you can slam your foot down," Davis said. Researchers have found two ways to correct the problem of "hard running." As part of the Hong Kong study, runners were put on a laboratory treadmill and trained using visual biofeedback to make their feet land more softly. 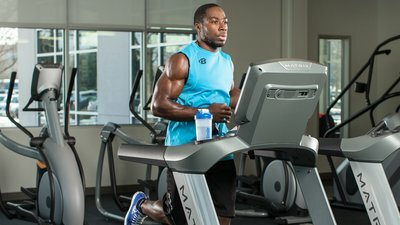 Runners could watch on a computer screen as their feet struck the treadmill surface, and change their gait to reduce the impact. The study's lead researcher, Roy Cheung, Ph.D., also recommends that runners use a mid-strike pattern of running. In another study, researchers at the University of Tennessee used audio feedback of the sound of the runner's foot striking a treadmill. In both studies, runners significantly reduced how hard their feet struck the running surface. Davis has some practical advice for people who don't have access to either source of feedback. Start by taking out your earbuds, she says, then pay attention to the sound of your footsteps. "If you land louder, it's harder," Davis says. "It's work, but you can make your foot strikes softer." Chan, Z. Y., Zhang, J. H., Au, I. P., An, W. W., Shum, G. L., Ng, G. Y., & Cheung, R. T. (2017). Gait retraining for the reduction of injury occurrence in novice distance runners: 1-year follow-up of a randomized controlled trial. The American Journal of Sports Medicine, 0363546517736277. Tate, J. J., & Milner, C. E. (2017). Sound-Intensity Feedback During Running Reduces Loading Rates and Impact Peak. Journal of Orthopaedic & Sports Physical Therapy, 47(8), 565-569.